Five students from University of Lynchburg participated in the Virginia Foundation for Independent Colleges (VFIC) 12th annual statewide collegiate Wachovia Ethics Bowl on February 13-14 on the campus of Virginia Wesleyan College in Norfolk. The theme was “Ethics and Privacy.” Serving as co-chairs for the event were Roger Mudd, author and former journalist for CBS and The History Channel, and LC President Kenneth Garren. The LC team, which defeated three teams during the competition, debated a variety of case studies highlighting privacy-based dilemmas. Sweet Briar College won the bowl, with Hampden-Sydney College as the runner-up. “Our team did spectacularly in the debates and I firmly believe that had they been advanced to the final round they would have been victorious,” said Dr. Laura Kicklighter, assistant professor of philosophy and religious studies, who coaches the team. 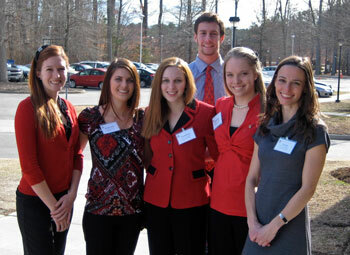 The University of Lynchburg student team members (pictured from left) are: Jillian Gates ’13 of Venice, Fla., Stephanie Wells ’14 of Wilmington, N.C.; Cameron Craddock ’11 of Lynchburg, Va.; James Kirkpatrick ’12 of Basking Ridge, N.J.; and Katherine Chappell ’12 of Chesapeake, Va.; with Dr. Kicklighter. Many notables from the business sector, law, education, finance, journalism and other fields served as judges. Martha Ann Alito, wife of Supreme Court Justice Samuel Alito, was one of the judges. The team also had the opportunity to meet Justice Alito.